Happy official 2015! 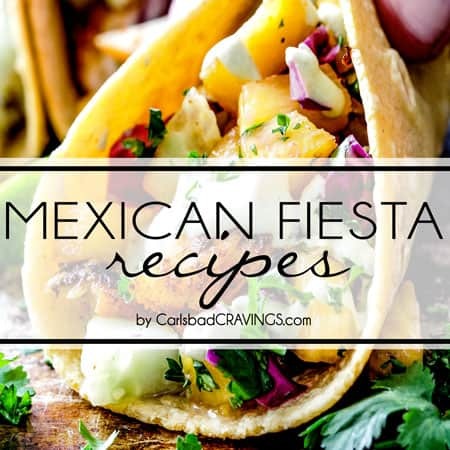 When I was deciding what to post for my first ever recipe in 2015, I wanted to post either Asian or Mexican (my Top 2014 Recipes might have given you that hint 🙂 ) – because they are my two favorite food groups – and I wanted something sweet and spicy – because that’s my favorite combo – and although this sounds all about me so far, I also thought about what YOU would absolutely love that is one of the easiest, most versatile meals, that you can dress up for company (I served this to friends last week) or simply serve with rice and call it a day – and my taste buds landed on Sweet and Spicy Pineapple Salsa Chicken – slow cooker style. I am so in love with this chicken. 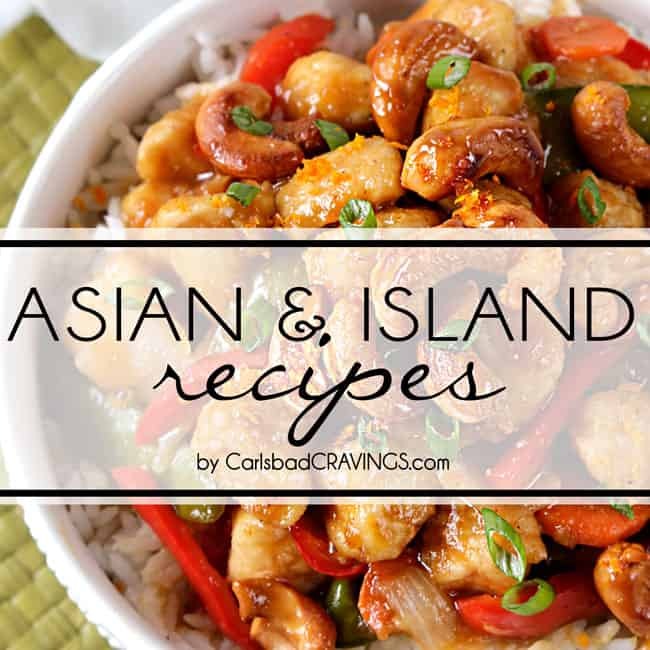 It was inspired by the very popular Asian Firecracker Chicken recipes going around where the sauce is a combination of buffalo hot WINGS sauce and brown sugar – sweet and spicy and lip smacking good. Add some garlic powder, onion powder, smoked paprika, green chilies and salsa and we have a Mexican sweet and spicy sauce that is lick the plate good. 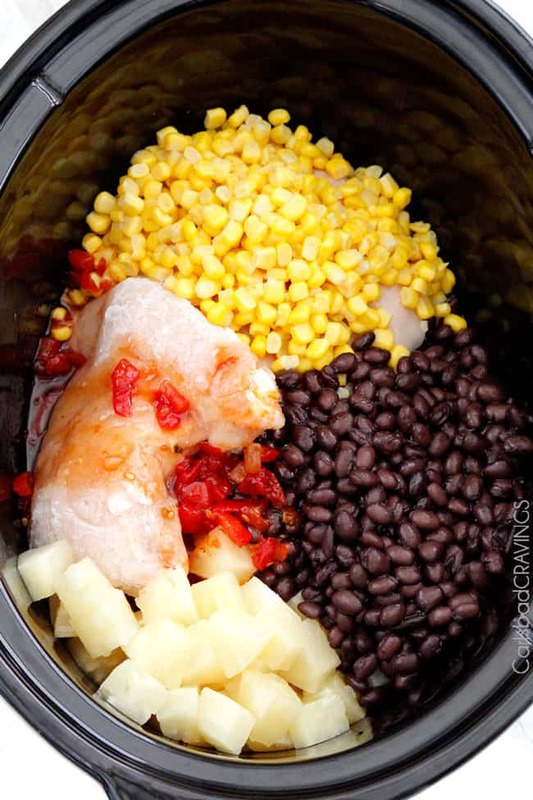 Add some chicken, black beans, sweet corn, and sweet and tangy pineapple to cook and soak up all the flavor and we have a meal that is lick your neighbor’s plate good. 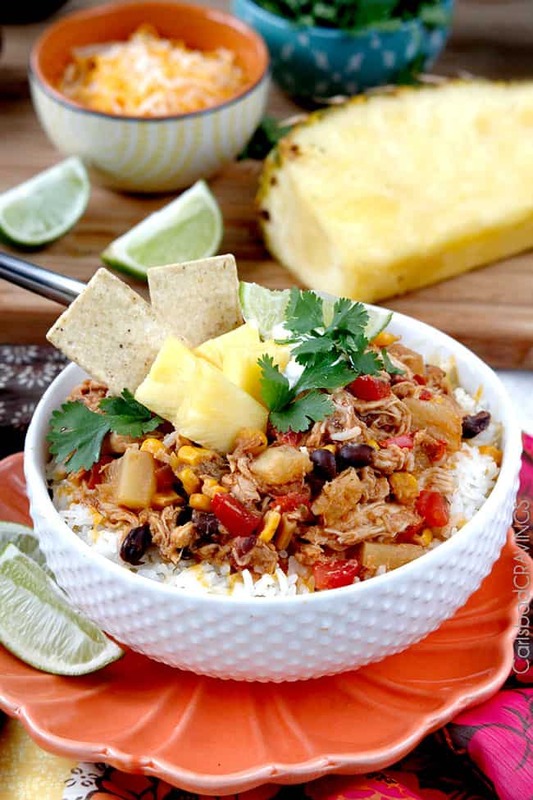 This Pineapple Salsa Chicken makes a favorite filling in burritos or tacos but my personal favorite is to drain the liquid then use any excess liquid (plus needed water) to make rice, then pile rice, cheese, Pineapple Salsa Chicken, lettuce, sour cream and crushed chips for an out of this world burrito bowl. Lick your plate, your neighbor’s plate, the serving plate good. As promised, 2015 is going to be a crazy good year! 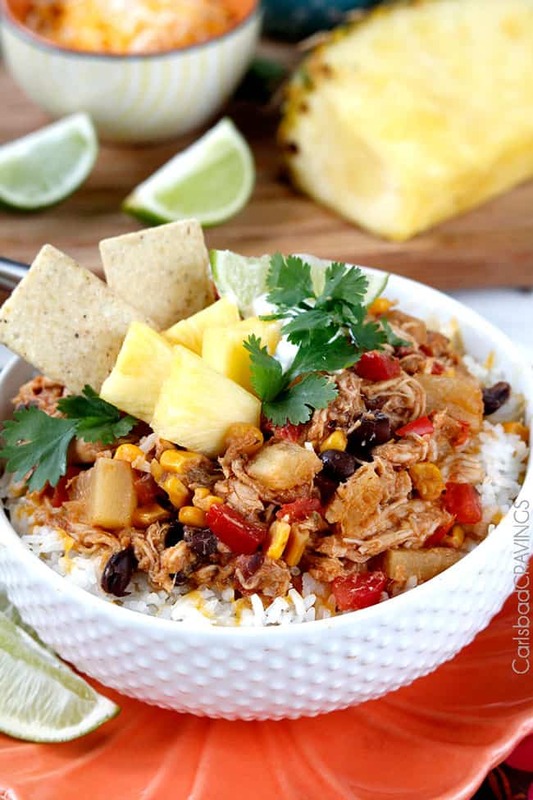 Want to try Slow Cooker Pineapple Salsa Chicken? 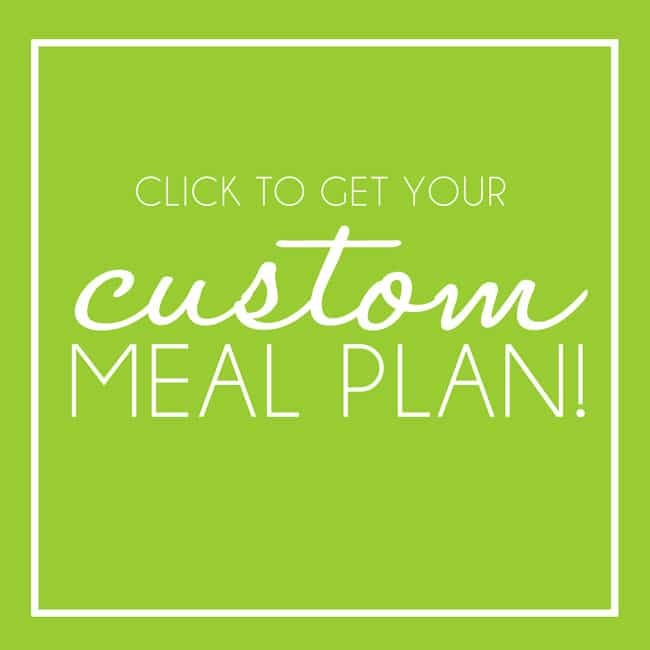 Pin it to your Crockpot, Chicken or Mexican Board to SAVE for later! 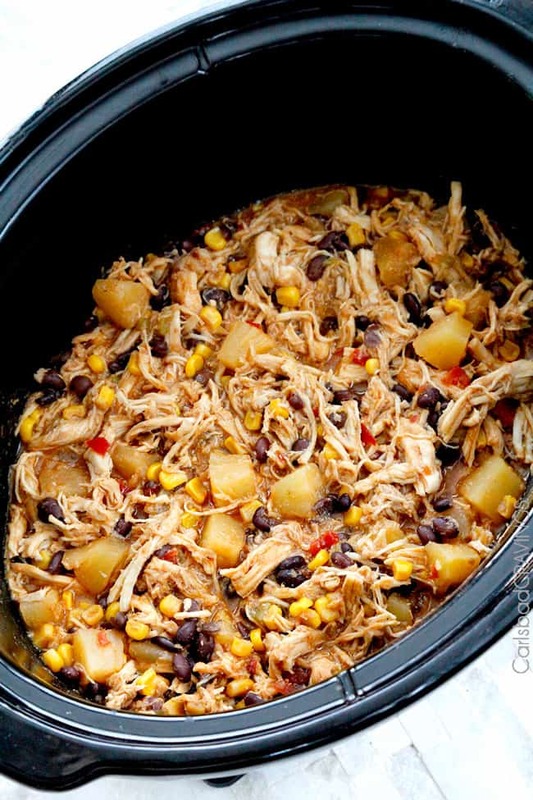 Place the chicken in the slow cooker then add the rest of the ingredients. Start with 3 tablespoons hot wings sauce and add more at the end of cooking if you aren't sure how hot you want it. Transfer chicken to a strainer and drain off any excess liquid. 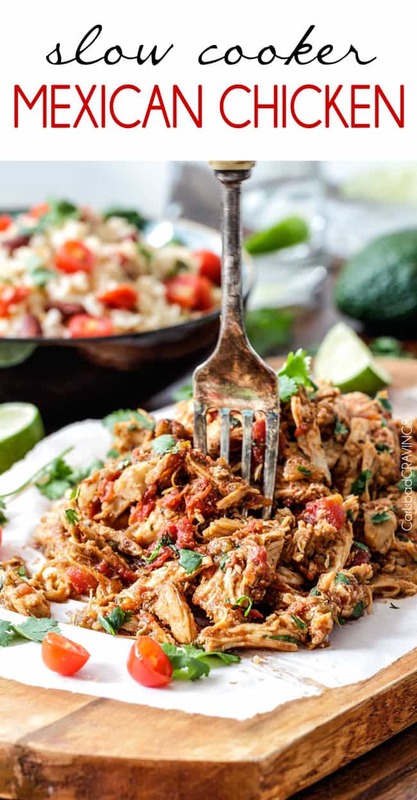 Serve chicken over rice or in tortillas, on salad, etc. with desired garnishes. *Regular hot sauce will NOT work in this recipe as hot WINGS sauce is much spicer and creamier. If you are not sure how spicy want it, start with 3 tablespoons hot wings sauce and add more at the end of cooking time. SEE BELOW for a list of more recipes using Frank's Hot WINGS sauce. **If you are using the total 1/3 cup hot sauce, you might want to add more brown sugar to taste at the end of cooking to balance out the heat. This looks so good!!! My only problem is that i don’t own a slowcooker… They are not so popular yet where i live (the Netherlands). Do you think i could make this on the stove-top? Hi Diana, welcome all the way from the Netherlands! 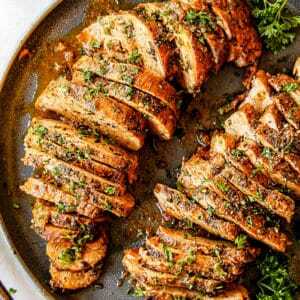 To convert this to the stove-top, I would cut the chicken breasts into a few pieces (they don’t need to be small – you will still shred later), brown then add the remaining ingredients, and cook at a gentle simmer for 30 minutes or until the chicken is tender enough to shred. Shred chicken and continue to simmer for as long as desired – the longer it simmers, the more the flavors will develop and meld. Just a note that there will probably be more liquid because more liquid evaporates in the crockpot. Enjoy and I can’t wait to hear how it turns out! 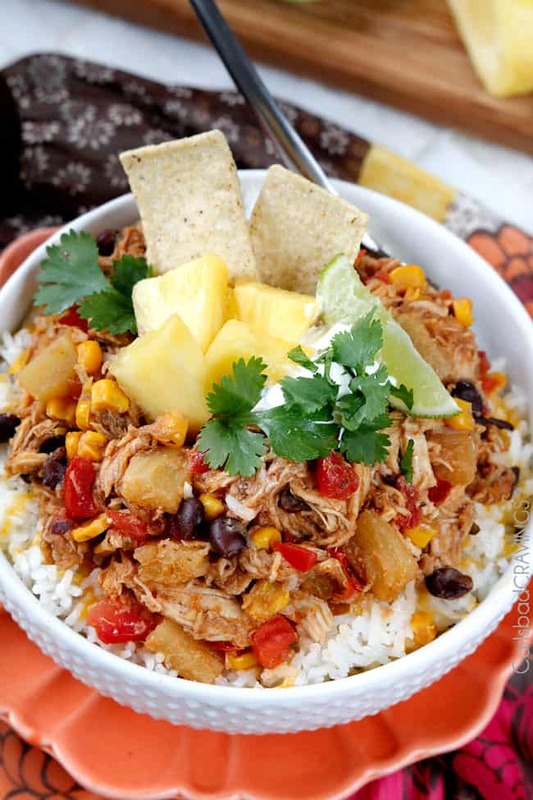 Slow cooker dishes like this are always a hit in our house! 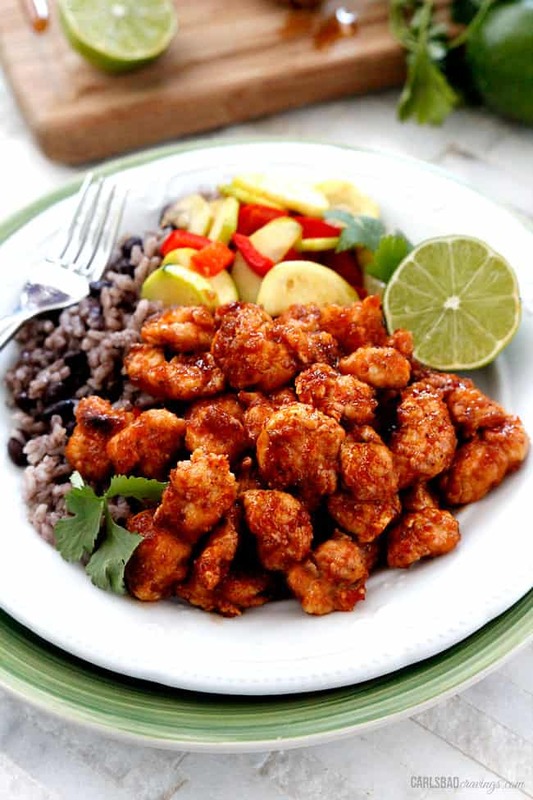 I need to make this sweet and spicy chicken! My Hubby will love it! Hi Anna! 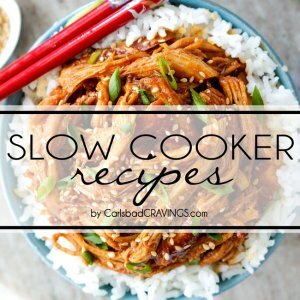 I love slow cooker dishes too and have far too many in my archive to share 🙂 I hope you and your hubby love it! This was fantastic! I’m a blended family of 6 kids. After my divorce, I started dating a man with 3 kids – fast forward and we all live together (my 3 + his 3). I warned him that I was a terrible cook which was a big bummer because his ex-wife was a fantastic cook. 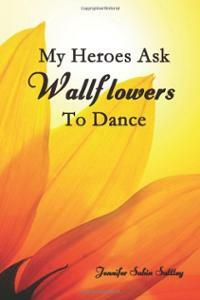 I try really really hard but I seem to botch every thing i do LOL! It’s a running joke with us all! Last night I made this and guess what? It was a total hit!! I’ve pinned this, saved it and printed it! Thanks for sharing!! You are a busy and amazing women Jamie! I am thrilled this was such a hit at your house! YAY! 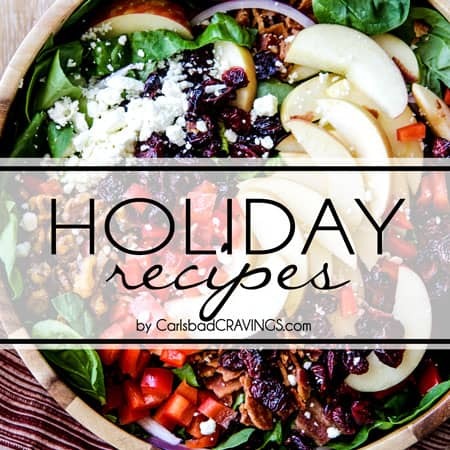 I hope your cooking adventures continue to improve and get rave reviews 🙂 You might want to check out my other slow cooker recipes for some no fail dinner ideas 🙂 Best to you and your family! Would crushed pineapple work? I have some on hand and thought about substituting. Hi Alisha! 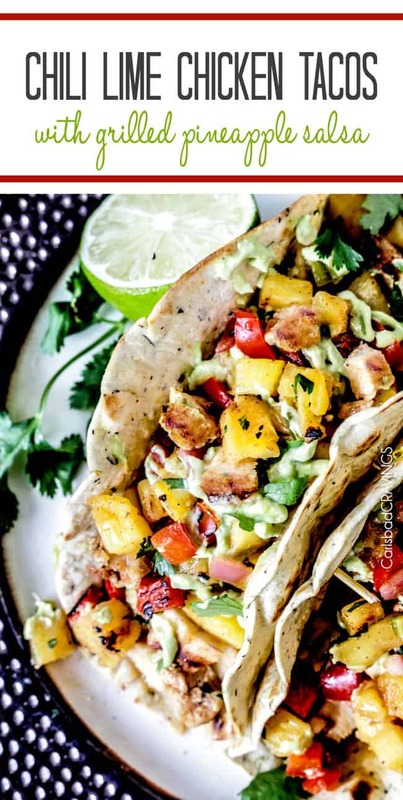 You can certainly can use crushed pineapple. It might be a little bit more liquidy at the end but you strain the excess liquid off anyway, so it should be just fine. Enjoy! 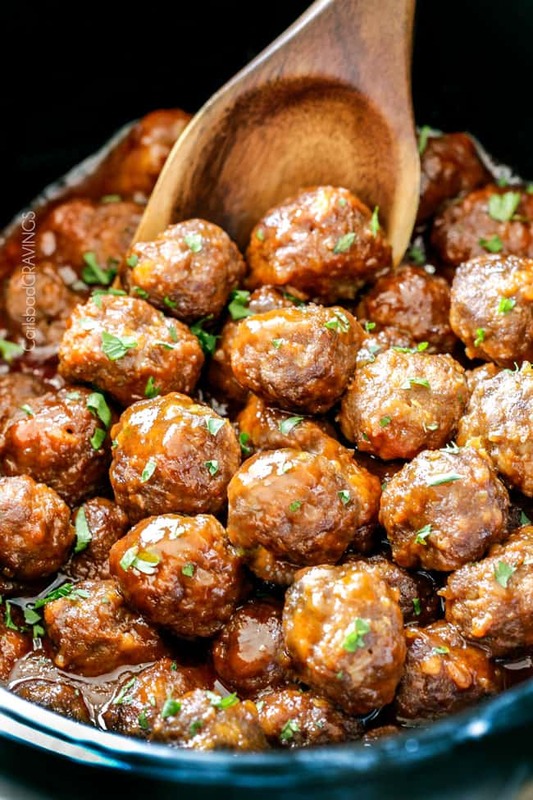 I made this last night (but I also added a can of mango chunks, which kind of melted in the crock pot, but gave this WAY more flavor), and my boyfriend said it was so good he wanted me to make it every night! Thank you for this amazing recipe! You are so welcome Kylie, I am so happy you both loved it! And I love the idea of adding canned mangoes! I love mangoes but honestly, didn’t even know they came in cans, I am definitely going to have to check those out – thanks for the tip! So how spicy is this if I even do 3 TBS? I am such a wimp! 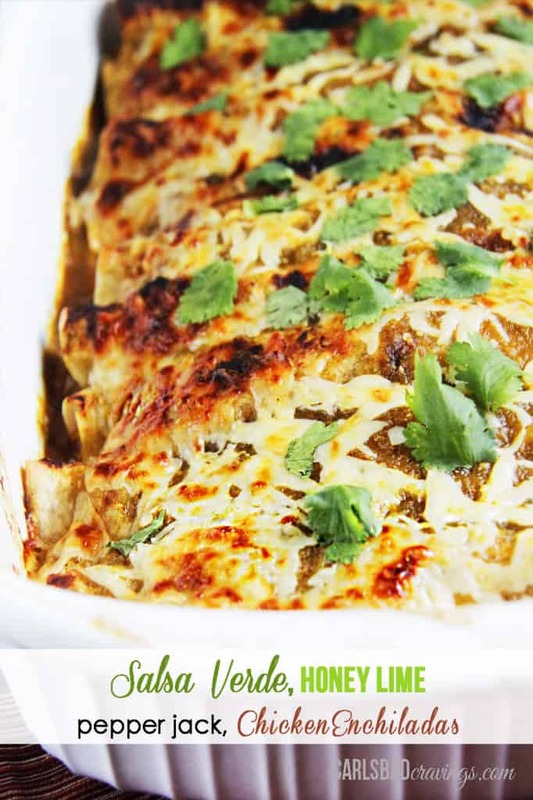 This looks so delish and am having company tonight, I would love to make this! Does it have a kick at all with the added brown sugar to balance? Hi Lacey! It has a very, very mild kick with the 3 tablespoons but is the perfect amount of heat for my mother who is a self declared “spice wimp” herself :). That being said, I had company over last week and made this with only 3 tablespoons because I didn’t want it to be too spicy for anyone and everyone added more hot sauce to their individual servings. So to be safe, I would make it with 3 tablespoons hot wings sauce and add more to taste at the end or simply have the hot sauce on the table so everyone can adjust it to their own taste. Hope this helps, enjoy! I can’t find Frank’s wing sauce anywhere around me. (I am from Buffalo originally, so this is actually very upsetting.) That being said, if I can only get regular hot sauce, how much would I need? Hi Nicole, I’m sorry you can’t get Frank’s hot wings sauce- I would be upset too! You can always buy it on Amazon 🙂 I would say you would need at least 2x the amount so to be safe, maybe start with 6 tablespoons regular hot sauce and add more to taste at the end. Also, just be aware that other hot sauces aren’t as creamy/buttery as Frank’s hot wings and don’t have the same flavor profile so it won’t taste quite the same and because you need more hot sauce there will be more extra liquid which isn’t a problem because you drain off any excess liquid, just wanted you to be aware. Hope that helps! Made this to take to a potluck lunch yesterday. It was great – I wasn’t sure what it would be like since there are some unusual flavors mixed together, but we all loved it. Hi Betsy, I am so happy you loved it – especially when bringing it to a potluck! 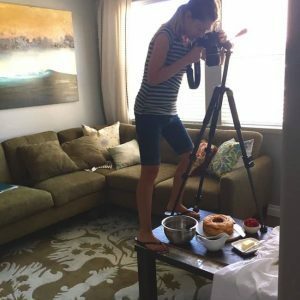 I am so glad you tried it even if you weren’t sure how it would turn out – I hope you find more recipes to try and love here! 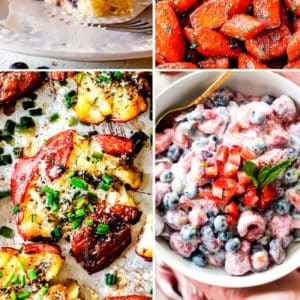 Jen, I ended up here following a Friday Favorites link from Iowa Girl Eats and everything looks amazing. I’ve saved so many recipes to try. So glad I found you. BTW, I have a friend who got a lung transplant last year so that she can be a CF survivor too. Modern medicine is an amazing thing. I am so glad you found me, yay! 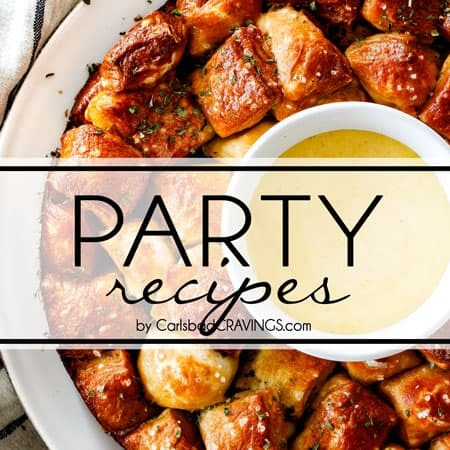 I am excited for you to try some of my new recipes – I hope you love them all! Please tell your friend congratulations to your friend and her lung transplant – that is amazing! Its been over 15 years since my lung transplant and I am grateful everyday for my donors and modern medicine as well, truly miraculous! We are so blessed. Welcome to Carlsbad Cravings! Today was my hubby’s birthday. I gave him my iPad opened to my recipe box and asked him to pick a meal. He chose this delicious chicken dish! I realized after lunch it was a crockpot meal but decided to chance it in my Dutch oven. It was delicious! I accidentally added 1/3 cup of the hot sauce right off the bat but found it perfect. The sauce was plentiful and thin so near the end of cooking I removed the top for a bit and it cooked down into the perfect sauce. I didn’t drain it at all. We ate it served over rice with lime and cilantro, and a few corn chips on the side. I’m going to have him pick out my recipes more often. 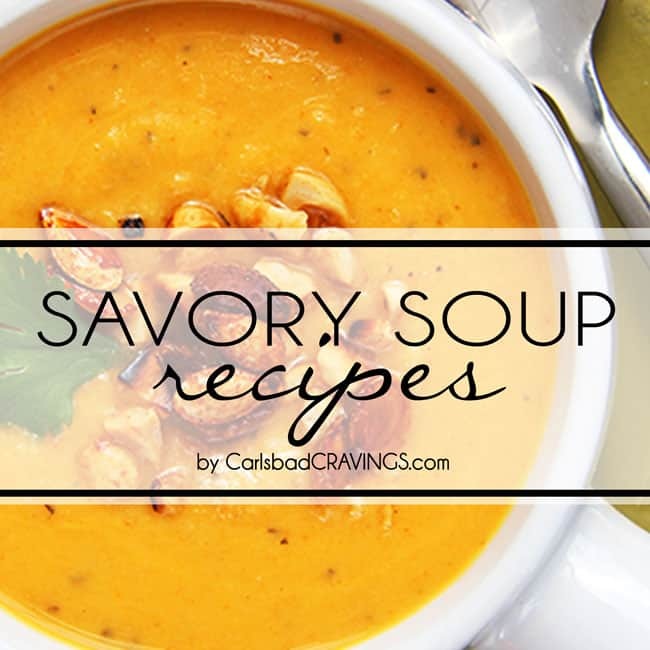 I collect them, download into my recipe box and often don’t get around to trying them. This will be on my regular rotation! Do you pile the ingredients on top of the chicken and stir them together ? Or just pile them on and let them cook? Thanks! HI Mignon, I would stir them together a bit on top of the chicken. Enjoy! Have you ever frozen this afterwards? I’m considering compiling burritos and freezing them with our leftovers. (It makes a lot for just the two of us.) I just would hate to try it and waste it if it doesn’t work out well because we like it so much! Hi Calli, I have never frozen this but I think it should freeze just fine as everything in it seem freezer friendly. Sorry I can’t be of more help! So happy to hear you enjoyed it! Hi Jen! I made this twice, and we all loved it! Our three-year-old girl who likes spicy food said, “It is spicy!” and ate it all. James really liked it, too. I only used 2 tablespoons of hot wing sauce, but next time I will like to add more. I’ve been using Crock Pot a lot on Sundays because our ward starts at 1:00 this year. 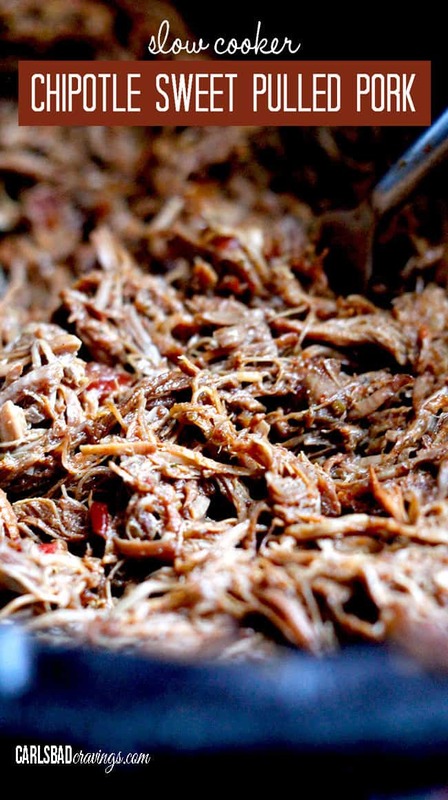 I would like to try your other Crock Pot recipes! P.S. 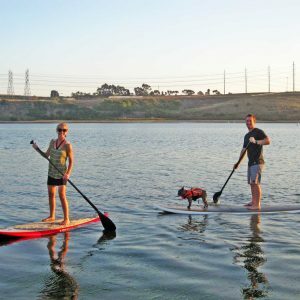 We might go to San Diego in the end of April, and this time we would love to see you! We ended up getting sick around Thanksgiving time, so we couldn’t go. Anyway, if we go, I will let you know. Happy almost Easter! 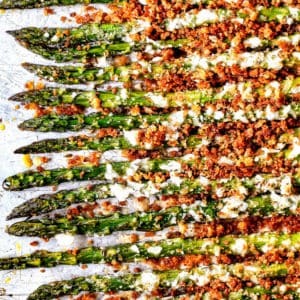 Is it really 1 tablespoon of garlic powder? Yes it is! 🙂 You can always use less if you are concerned about it but it tastes amazing. I may be crazy, but I don’t see any chicken listed among the ingredients!? Details please. Thank you. You are not crazy! I actually made this yesterday and edited the recipe and when I did, the chicken disappeared – so sorry about that! I just updated it – it should be 2 pounds chicken breasts. Thanks! I am one that i count what i eat and keep track of it. Would you happen to know the nutritional facts? Serving? I only really need the facts for fats, protein and carbs. I didn’t see the serving size. So I wasn’t sure what it was. Hi Peter, I don’t do the calculations for my recipes, but you calculate here: http://www.myfitnesspal.com/recipe/calculator My best guestimate for serving size as its been a while since I’ve made this is 3/4 cup.